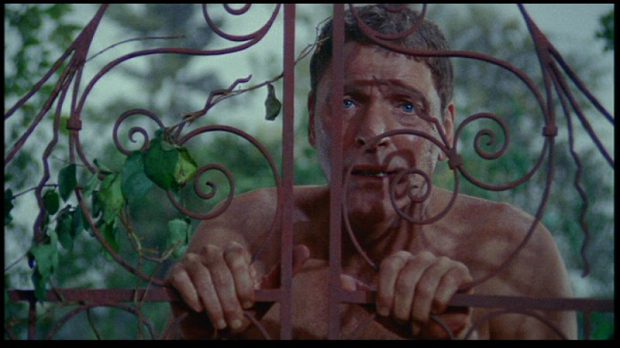 Burt Lancaster has called The Swimmer (1968), the favorite of all of his films. That’s quite a statement considering his output. The best known image of From Here to Eternity (1953) is when he and Deborah Kerr, both wearing bathing suits, embrace in the cascading surf. 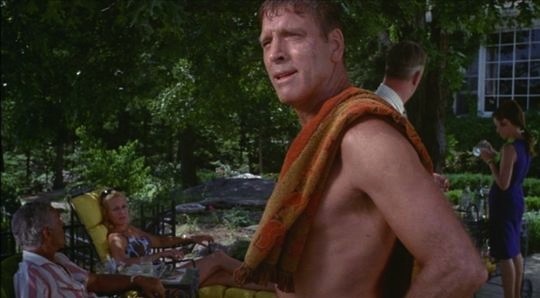 In The Swimmer, it’s fifteen years later in Connecticut, not Hawaii. Incredibly, though, Lancaster appears in as good a shape and according to the program guide, “worked out so much he put on 20 pounds of muscle.” Besides the physical demands placed on him, there’s also the burden of conveying who the enigmatic Ned Merrill is visually, in a story with terse, often absurd dialogue and an unconventional plot. When we meet Ned, he’s decided to “swim home” across the backyard pools of his affluent neighborhood. It’s an absurd quest as many of those neighbors point out. There are clues that he’s insane or at the least, psychologically damaged. Judging from their reaction, it’s not the first time he’s exhibited odd behavior. The story takes place during the 1960‘s Mad Men era of upper middle class conformity. Ned is an older and stranger Don Draper. 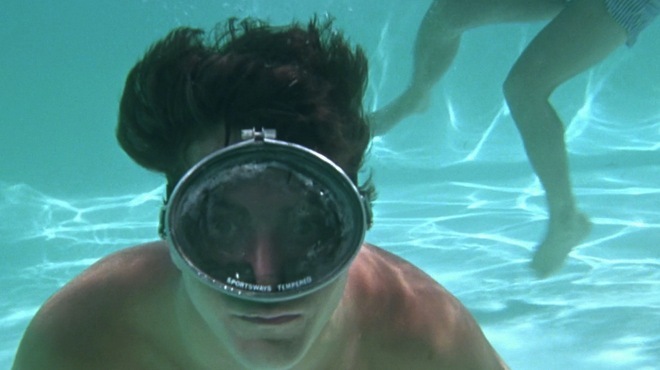 The swimming pool scenes also brought to mind Benjamin Braddock (Dustin Hoffman) lounging in The Graduate (1968). Unlike Ben, who’s just starting out, Ned has already had a career as an executive. Ben Braddock looks toward an uncertain future. Many of the neighbors have a history with Ned. He’s done things they resent. Lancaster plays him as a man awakening after a long sleep remembering his life as a dream. Cinematographer David L. Quaid brings that dream-like feeling to life. Marvin Hamlisch’s lush orchestral score, his first for a motion picture, enhances the mood. At first intrigued, Julie Ann (Janet Landgard) agrees to go on the adventure with him. “Mr. Merrill,” was her teenage crush. She backs out after realizing he’s hopelessly lost in the past. Shirley (Janice Rule), his former mistress, experiences the reopening of a deep wound with his unexpected arrival. 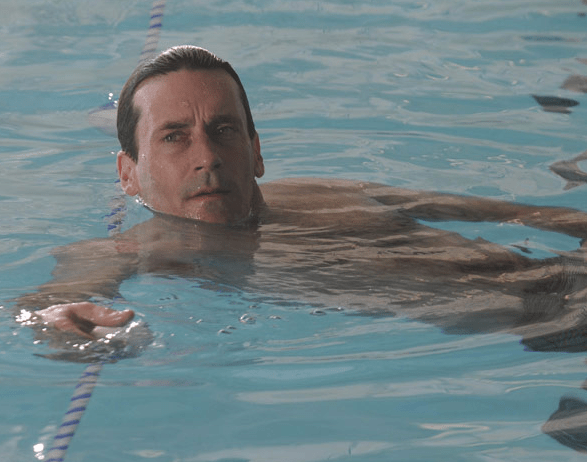 Joan (Joan Rivers), a new acquaintance whom he meets at a party in one of the backyards he’s swimming across, wants to believe him but can’t. Peggy Forsburgh (Marge Champion) and her husband Stu (Richard McMurray) are old friends who don’t know whether to take their Neddy’s “swim home” seriously or not. 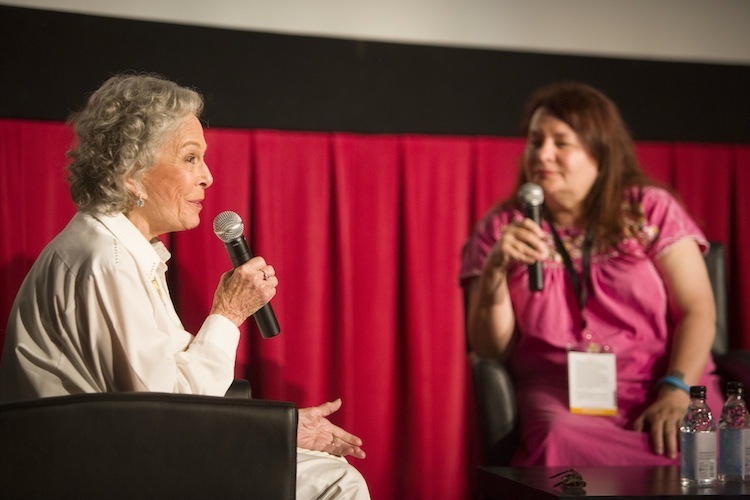 Champion appeared at the TCM Classic Film Festival’s Friday morning screening of The Swimmer, interviewed by Allison Anders [Gas, Food Lodging (1992)]. 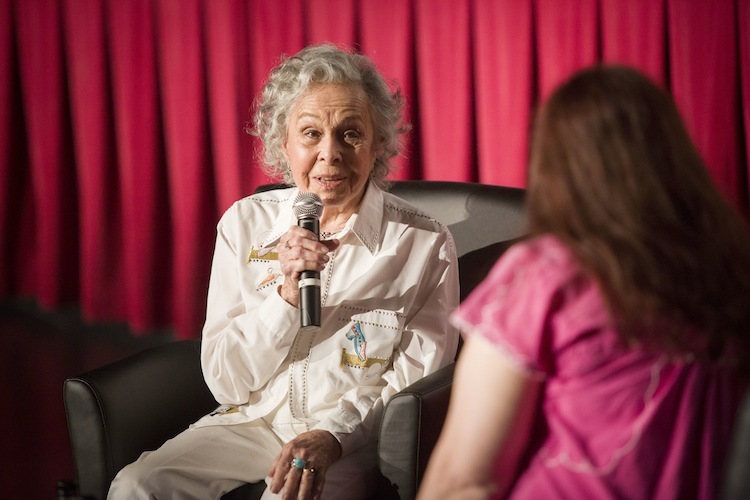 Screen veteran Champion reminisced about the making of what has become a cult classic.